What the internet would look like if there were no search engines? Twitter would have a lot more questions posted. Often times when I’m curious about something, it’s tempting to ask on Twitter. But then I quickly realize we have Google (or DuckDuckGo). If the internet had no search engines, we would have to find things via directories and indexes. I love diving through an index. Following different trails. Going down rabbit holes. Certainly, with search you can go down a rabbit hole. Indexes are even more prone for you to find unexpected discoveries. In most cases with an index, you are forced to have a start point that is not your exact term. You might get lucky and find your exact term in an index. But often you’ll have to start more broadly, and then slowly narrow down looking through various pages. Is there even an index on the internet any more? Yahoo used to have a directory. In the late 90s, it was THE place find websites. But Yahoo retired the directory in 2014. I’m kinda surprised it lasted that long. 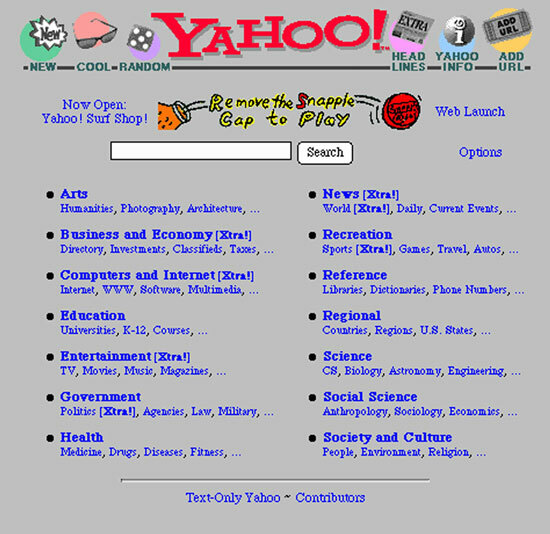 Although, I’m a bit upset that Yahoo doesn’t keep an archive of it online. Sadly, dir.yahoo.com doesn’t redirect anywhere. Imagine for one month you never use a search engine. Maybe I’ll try it for a week. I’m kind of afraid to do it, so I’m not committing myself to that yet. Maybe if someone challenges me. Then I’ll do it. Are you going to challenge me to use no search engines for one week? Side note: Google has no webpage results for “the internet with no search engines”. Only one mention in a book. Bringing back the card catalog!